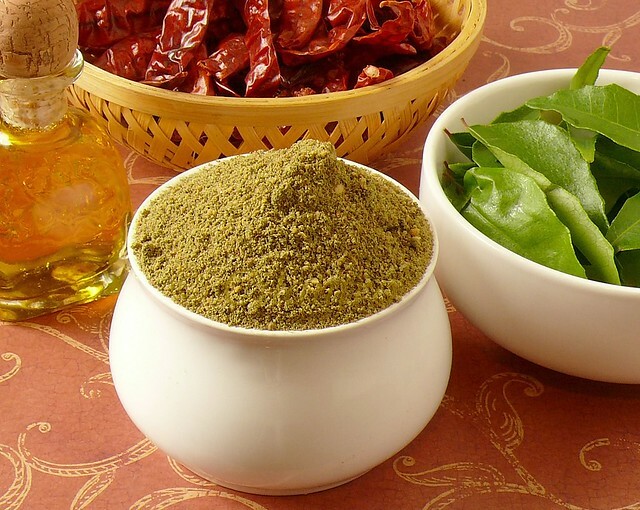 Spiced powders hold a special place in South Indian Cuisine. A blend of fresh spices coarse ground with aromatic curry leaves , Kariverpillai podi is a foodies delight. Athai makes two different versions of the Kariverpillai podi , one a simpler version which I am posting today and the other one with garlic which I will be posting later. While in India, she made both the versions of Kariverpillai podi for us and I took note of the recipes. Curry leaves are used in seasoning in south Indian Cuisine . They are beneficial in treating Digestive Disorders, Kidney Disorders, Eye Disorders, Premature Graying of Hair, Burns and Bruises, Insect Bites and many more. Wash and dry the curry leaves ( allow them to dry in shade or pat dry to remove the water) . Make sure there is no moisture. Add a tablespoon of oil in a pan and add the Bengal gram and black gram and fry them on medium heat till they turn light brown in color. Remove from the pan and let cool. Now add another teaspoon of oil, add the dry chillies and sauté them for about 2 to 3 minutes. Make sure not to burn them. Remove and set aside. Again add another teaspoon of oil and add the curry leaves and toss them till crisp and roasted. Now add the tamarind and toss for few seconds and set aside. When all the ingredients are cooled completely, grind them to a coarse powder. Mix in salt and asafoetida to the ground powder and store in an air tight container. Serve with nice hot steaming rice with ghee/ clarified butter. Also use in stir fries to make them more flavorful. won't the addition of tamarind make the mix a little wet? how come it's completely dry like a powder then? I had heard about this podi, but the photo you have taken is very charming.. makes one want to make the podi even more! Wat a flavourful podi, just with rice topped with ghee i can have this podi anytime..
Nice picture. My mom makes a similar podi that goes very well with idlly & dosa. I will try your version one time. Wonder spice powder. I love this one. Great looking spice blend and great photos. Welcome back Cilantro. thats such a healthy and spicy powder. Thank you for your clear and simple recipe of home made powders. I tried this chutney pudi and was happy to find it retained its green hue.I have given a link to this recipe in my blog. Hope you won't mind. These look incredible. As soon as I'm home at Christmas I am baking a batch.